Although I've never eaten in his restaurants, I became a fan of Marc Vetri after reviewing his second cookbook, Rustic Italian Food, a couple years ago. I have featured his recipes for Mortadella Tortelli with Pistachio Pesto and Spinach and Ricotta Gnudi, both from that book, and loved them immensely. What I enjoy so much about Vetri's writing is his respect for the ingredients and attention to detail. He goes in depth to discuss the technical and even chemical reactions that cause foods to react the ways that they do. This way of approaching cooking a big reason why I feel his cookbooks are a wonderful addition to any avid cook's book collection. I recently received a review copy of his newest release: Mastering Pasta. Although Vetri included a chapter on pastas in his previous publication, this book is entirely devoted to the subject. Consider this almost like an encyclopedia of pasta, if you will. 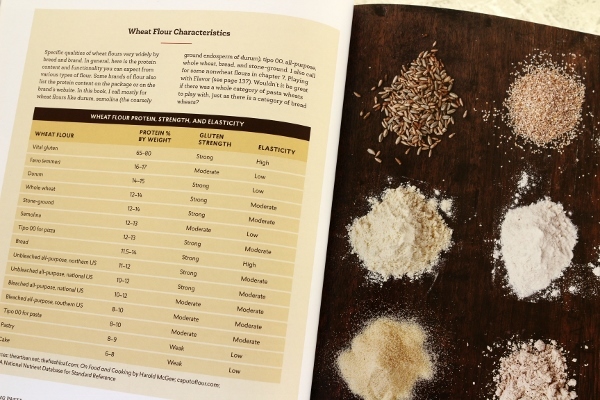 It actually starts out with a chapter discussing wheat flour, the anatomy of wheat, ancient and modern wheats, milling and freshness of wheat, gluten quantity and quality, flour characteristics, and more. Once again, he's focusing on the whys and hows and not just the whats. 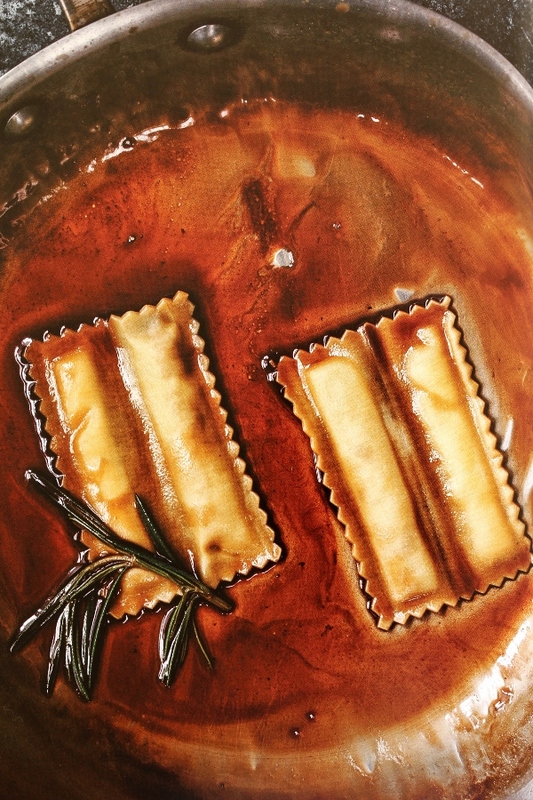 The book continues with legions of recipes for Fresh Pasta, Baked Sheet Pasta, Ravioli and Stuffed Pasta, Extruded and Dry Pasta, Playing with Flavor, Hand-Formed Pasta, Gnocchi, Risotto, and finally Stocks, Sauces and Other Basics. Although I own the pasta roller and cutter attachments for my Kitchenaid, I do not own a pasta extruder, so those recipes aren't really useful to people in my shoes, but fortunately they do not make up the bulk of the book. After reviewing all the hows and whys, it's time to start cooking. The recipes within this book are commensurate with those found in a fine dining (but not pretentious) Italian restaurant, with smaller suggested serving sizes than most home-style cooking (think more along the lines with a first course/primi in an Italian restaurant versus the main course of the meal). Dishes like Pappardelle with Rabbit Ragu and Peaches, Eggplant and Parmesan Rotolo, Pea Agnolotti with Lardo, Cabbage Gnocchi with Sausage and Toasted Bread Crumbs, and Dove Pasta with Quail Meatballs really set the bar for the style of elegant, yet rustic, flavor profiles contained within. 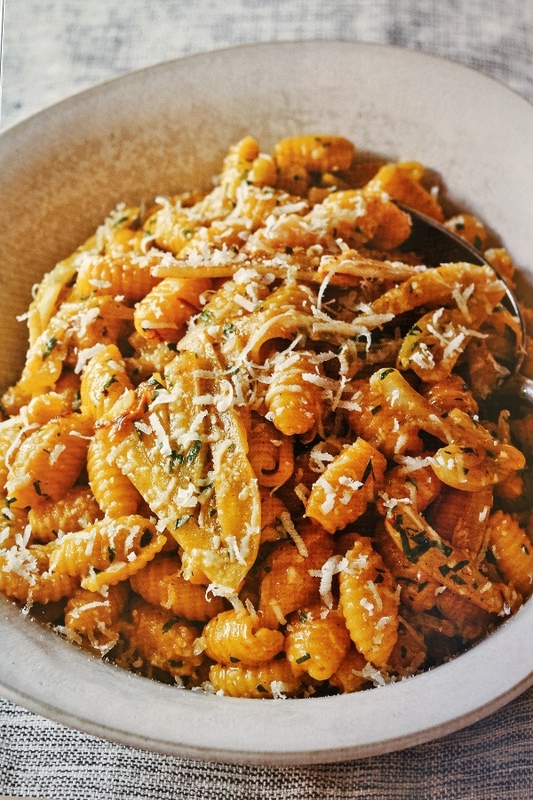 One minor criticism is that some of the recipes for shapes like cavatelli and gnocchi Sardi/Malloreddus are described as "hand-formed" pastas, but utilize a tool for extruding them. While many home cooks may have a pasta roller, and even perhaps a pasta extruder, these specific tools mentioned for these shapes are, from my understanding, less common for home cooks. 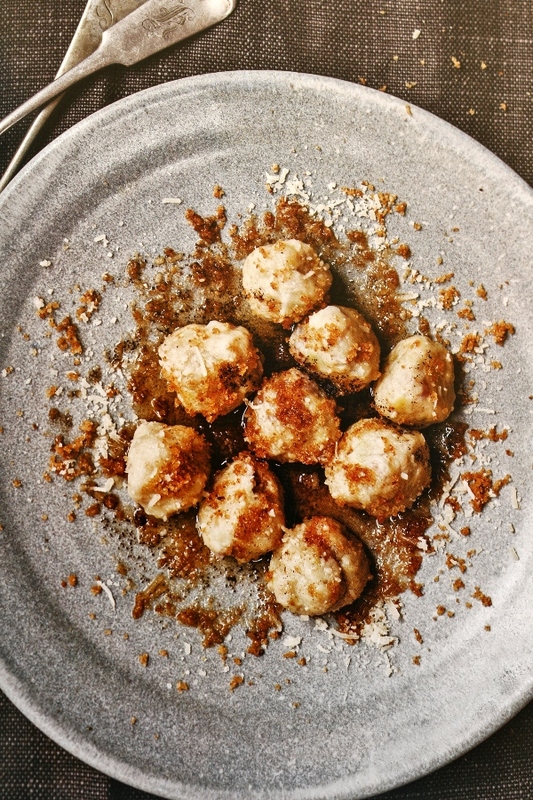 I have other recipes for the same shapes that are truly "hand-formed" and use the same method of shaping other gnocchi, either on a gnocchi board or the back of a fork. This alternative method would have been nice to mention for anyone who doesn't have this very specific tool, since I know they can be shaped by hand otherwise. Other than these concerns (which apply to a minority of the recipes), I really love this book. 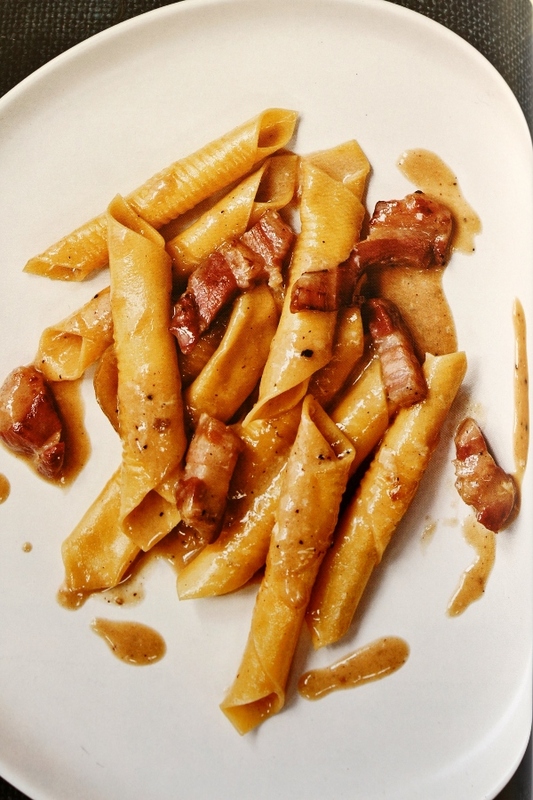 It features wonderful step-by-step instructions that are easy to follow, mouthwatering photographs, and a variety of skills that can even translate into your own recipes: once you learn how to shape garganelli in the Garganelli alla Carbonara recipe, you could easily use that shape for many other sauces in the future! I have a pretty lengthy list of recipes I'd like to try (none of which include the particularly hard to source ingredients). 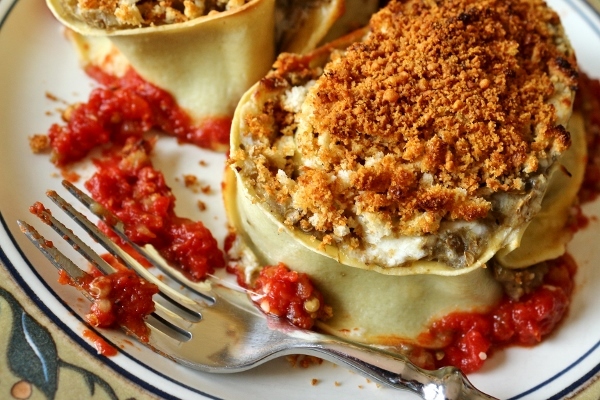 I decided to start out with the Eggplant and Parmesan Rotolo, which is basically a spin on Eggplant Parmesan, one of the greatest dishes of all time. 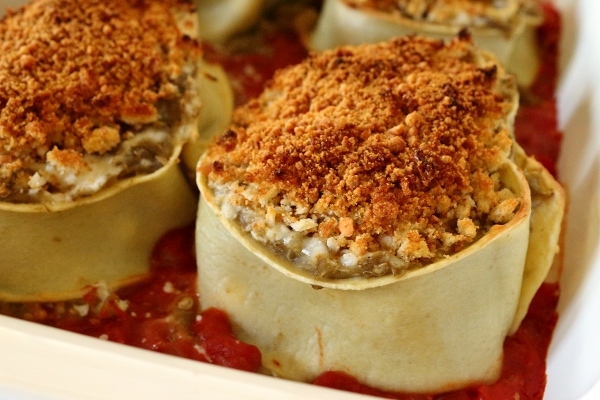 All of the key players are represented: eggplant (puree/filling), bread crumbs (on top), tomato sauce (beneath rotolo), mozzarella and Parmesan cheeses (filling/topping), and pasta (holding everything together). I'd even like to go out on a limb and say this is healthier than Eggplant Parmesan because it's not fried. So there you go! 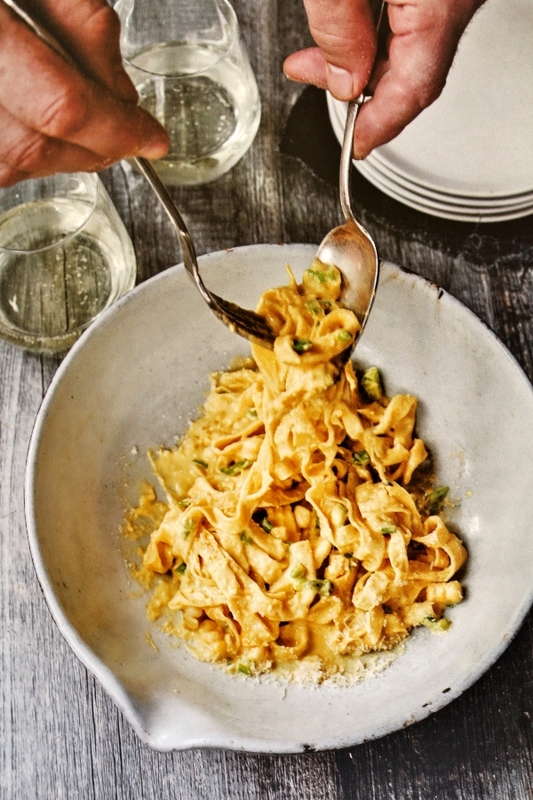 This is one of the easier fresh pasta dishes in the book because you simply roll out the dough, blanch it, and then spread filling over the top and roll it up. It's not as technical as a filled pasta, but in a way it's still "filled" since it has a filling with pasta wrapped all around it. 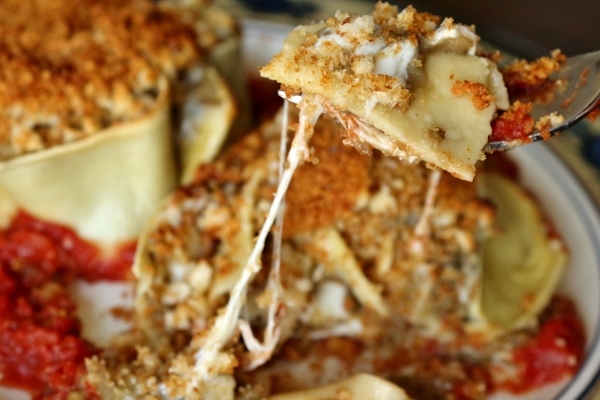 The original recipe states that it makes 4 servings, with 1 rotolo per person. Although the rolls themselves aren't huge, I definitely think one person can eat 2 rolls if this is their entire meal. If the rotolo are being served with other dishes, or even a simple side salad, 1 may be plenty per person, but I've noted that this can serve 2 to 4, since in my family we each ate 2 rolls each (and were very comfortably full afterwards). 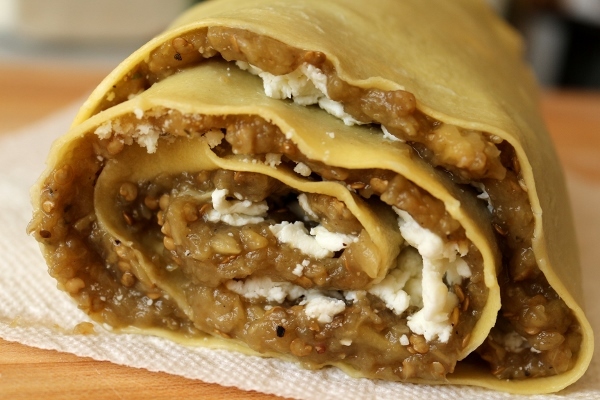 These rotolo (rotoli, plural?) are absolutely delicious! 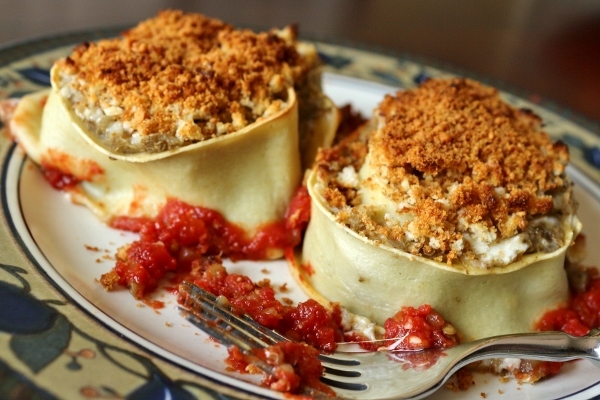 As someone who loves the flavors of Eggplant Parmesan, I really enjoyed this spin on the classic. I made some minor changes, and even doubled the recipe to use 8 ounces of dough and make a total of 8 rotolo (which I baked in 2 separate dishes), but the measurements below are the same as in the book. I just included some extra notes in italics and also at the end of the recipe. Mastering Pasta is a wonderful resource for learning about making and using fresh pasta, whether in the form of sheets or extracted dough. 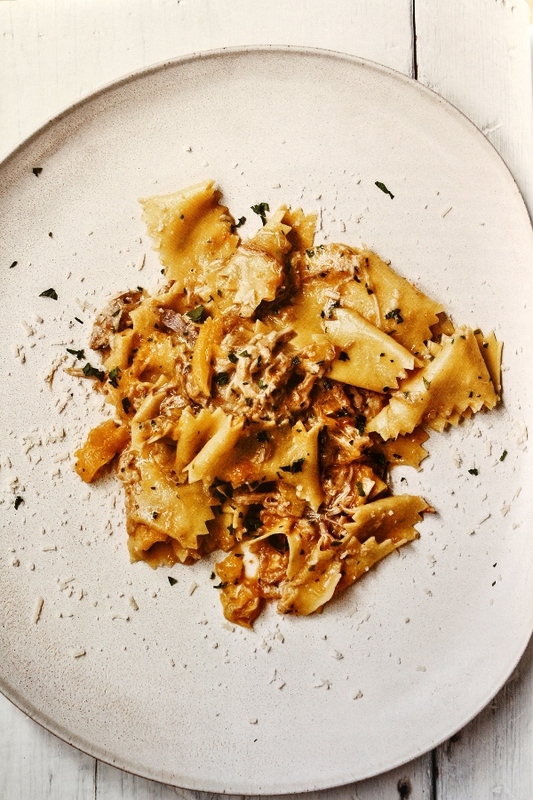 It contains lots of appetizing recipes, and creative techniques that will keep any pasta-lover satisfied. I definitely look forward to trying out more recipes, and using this wonderfully researched book to improve my fresh pasta-making in the future. Heat 2 tablespoons of the oil in a large saute pan over medium heat. Add the bread crumbs and toast them, stirring or shaking the pan a few times, until golden brown, 4 to 6 minutes. Set aside. Heat the oven to 400 degrees F. Cut the eggplants in half lengthwise and score each half in a large crosshatch pattern with a sharp knife. Set the eggplants, cut side up, on a rimmed baking sheet and season the flesh with salt and pepper. Strip the leaves from the thyme sprigs onto the eggplant, then drizzle the eggplant evenly with the remaining 4 tablespoons olive oil. 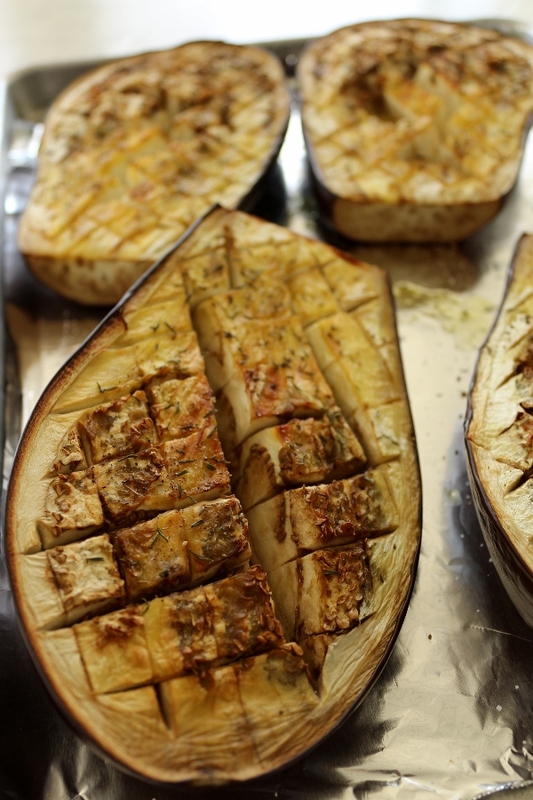 Roast the eggplants until very tender and golden brown, 30 to 35 minutes. Let the eggplants cool slightly, then scoop the flesh from the skins into a food processor. Using short pulses, coarsely puree the flesh. Reserve the puree. Bring a large pot of salted water to a boil. Drop in the entire pasta sheet and blanch it for 30 seconds, stirring and separating it with tongs to keep the sheet from sticking to itself. Carefully remove the pasta sheet and lay it out on kitchen towels or paper towels. Trim the edges square (honestly, I didn't feel the need to trim mine since it was fairly squared off already when I rolled it). 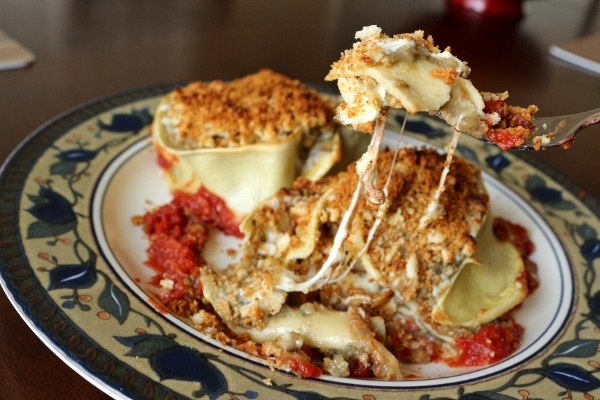 Spread the eggplant puree evenly over the entire sheet of pasta, all the way to the edges (you may have a bit left over). Top the eggplant evenly with the mozzarella and 1/4 cup (25 grams) of the Parmesan, and then sprinkle with salt and pepper. Starting from a short side, tightly roll up the sheet. 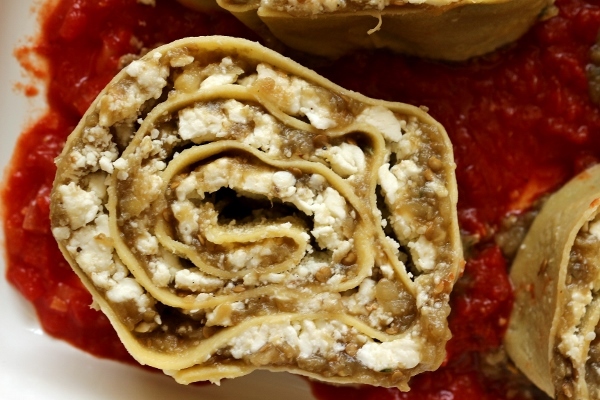 The rotolo should look like a jelly roll. Heat the oven to 500 degrees F. Spread the tomato sauce in the bottom of a shallow 2-quart baking dish, or for individual servings, spread 2 tablespoons of the sauce in the bottom of each of four 2-cup baking dishes. Using a sharp plain-edged or serrated knife, trim the ends of the rotolo (again, I think this is unnecessary since you can easily put the "ugly" edges on the bottom and no one will even notice the difference), then cut it crosswise into four slices, each about 1 inch thick. 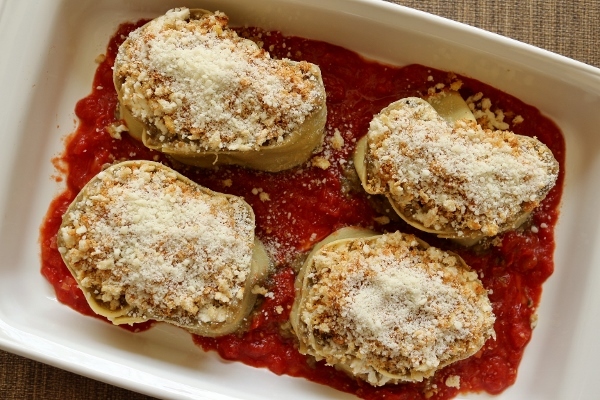 Lay the slices flat in the baking dish(es) and sprinkle the bread crumbs and the remaining 1/4 cup (25 grams) Parmesan evenly over the slices. Bake the rotolo until heated through and lightly browned on top, 10 to 15 minutes. 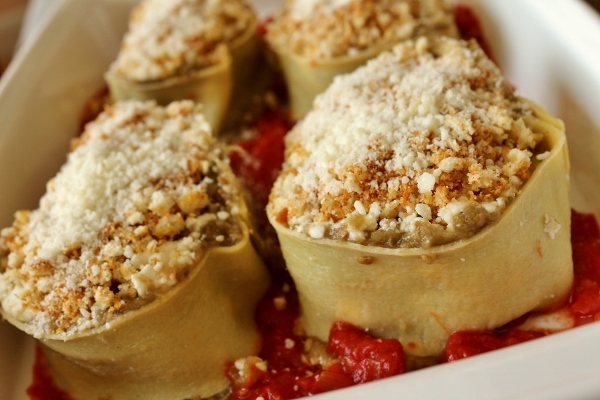 Transfer the rotolo slices to warmed plates if baking in a single dish, or leave in the individual baking dishes. Garnish each serving with some of the oregano, if desired. *Notes* I used a recipe similar to this basic dough, but with bread flour, an extra egg, and a tablespoon of olive oil and added a bit extra flour as needed to get the right texture. It yielded about 1 1/8 pounds dough. I then used half the dough to make a double batch of this recipe, with 4 rotolos in each of 2 baking dishes. For the tomato sauce, I sauced half a diced onion in a little olive oil, then added some minced garlic, a 28-ounce can of crushed San Marzano tomatoes, seasoned with salt and pepper, and simmered for about 10 to 15 minutes.